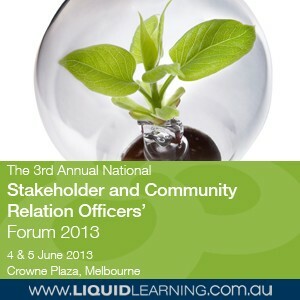 Liquid Learning is delighted to present The 3rd Annual National Stakeholder and Community Relations Officers’ Forum 2013 – the premier communication, professional development and networking platform to debate and prepare for the unique challenges of stakeholder and community engagement. A balance of case studies, including success stories and challenges across industries and expert presentations will allow delegates to fortify acquired knowledge and strengthen their own strategies. Follow this event on Twitter using the event hash tag #SCR13 and @LiquidLearning for daily industry updates! In recent years, Community Engagement and Stakeholder Relations has shifted to a more central and vital role within organisations. This is certainly helping organisations to unlock hidden efficiencies and develop a broader understanding of community needs. With new media being increasingly present in our day-to-day operations, this has impacted the operations of Stakeholder and Community Relations professionals extensively. On one hand, this new playground has introduced new challenges for professionals in diverse industries. On the other hand, this represents the chance to find new and effective ways to engage with communities and stakeholders. This Forum aims to reflect the different aspects of successful strategies, which need further consideration when implementing Community and Stakeholder Relations strategies. The Forum represents a unique opportunity for leading professionals to challenge themselves to proactively adopt new approaches, leaving the event with cutting edge “how to” tools. To request more information or book your place at this practical event, contact Liquid Learning via email: marketing@liquidlearning.com.au or visit our website above.